One issue that is notorious for causing issues with websites is caching. Many hosts offer content delivery networks (CDN’s) or server side caching, and can cause havoc on a shopping cart system. Caching is a way to speed up a website delivery by preparing, compressing, and having a stored copy of the content the customer is requesting. In many cases, this is a good thing, but sometimes in a dynamic shopping cart situation, we do not always want caching. How to know if you have a Caching issue? People might place items in the shopping cart, then not be able to update the products, remove products, or even see erratic products in their cart. This is mostly due to caching issues and the server is getting confused about what content it should distribute and to who. Are there ways to Cache successfully? Yes, we have good luck using WP Super Cache plugin and simply using the default settings and enable. This can greatly increase your website speed and offer a better experience to users. It has been working well with WP EasyCart. Are there Caching solutions to avoid? Yes, we have found server side caching is good for static websites, but a dynamic shopping system it can cause issues with. Try to avoid using CloudFlare or other server/hosting based solutions to cache. Firewall and security software can also cause issues. We have noticed GoDaddy is notorious for having caching systems running on their servers and often refuse to turn them off. 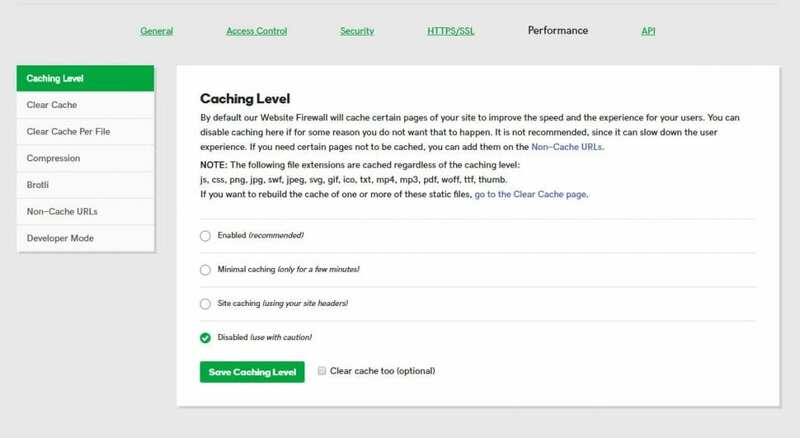 GoDaddy also offers firewall caching which is hard to detect but can be disabled. You may have to hunt for it on this hosting platform or search through your products and settings in order to disable it. If you feel you have a caching issue, the following steps are helpful to take. Check to see if you have a security, firewall, or caching plugin installed in wordpress, deactivate and see if the behavior goes away. Check to see if your theme offers some performance or caching built into it, if it does, try disabling it and see if the behavior goes away. Try deactivating all plugins except EasyCart, see if the behavior goes away. Contact your hosting provider, ask them if they have web host caching on the server running and if you can disable or turn off this feature. In worst case scenarios, moving to a new host may be required in order to get a more compatible wordpress environment, but in general, we find the above can usually solve the caching issue.